It´s a crazy tractor driver! wow... what a style way to do it!!! ahah gotta love my country! 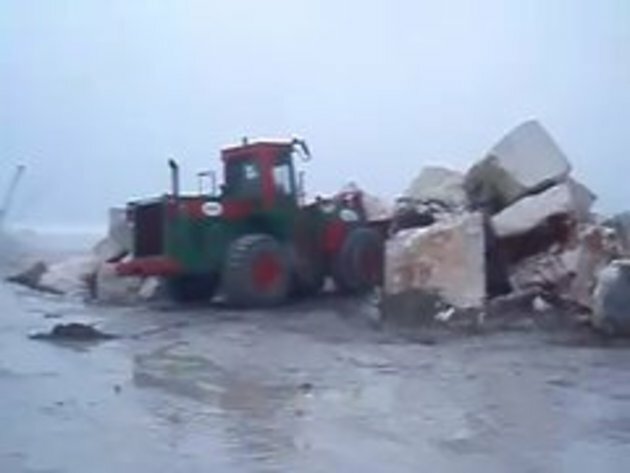 Wow,moving rocks Russian style! I bet he uses chopsticks instead of metal levers. Portuguese are crazy people for sure..
#10 (&#9) where i'm from there a 'front end loader'. Some nice skills, i just wonder what sort of strain that's putting on the front axle/wheels. I'm pretty sure they're designed to run with all 4 wheels on the ground. Caterpillar tractors are normally painted yellow and black. yea ok the rocks heavier than the vehicle but i cant really see what the big deal is here! Do the Hokey-Pokey, then dump the rock out! I think that guy is on drugs! That driver must've practiced doing wheelies on all his bikes and trikes and cars. Good work. Pure 100% skill, you think a foreman would let someone do that in a tractor without 100% safety no way! again ALL skill nothing else. a ganda costa da caparica caralho !!!! The tire guy messed up. Filled the rear tires with helium instead of nitrogen.